The Reverend Jack Russell was very interested in fox hunting and saw the need for a small terrier to be used to flush out foxes that had gone to ground. In 1814 he acquired a terrier female named Trump from the local milkman which became his foundation female – and so the breed was born. The first Jack Russells were quite tall dogs (35cm) but during the years the breed has changed, and there are now two distinct varieties that are recognised as separate breeds – the Parson Jack Russell and the Jack Russell Terrier. There are three coat varieties, a smooth coat, a broken coat and a rough coat. Jack Russells can live up to 14 years of age. 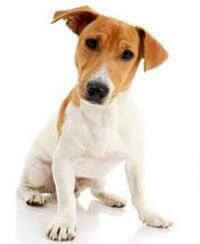 Jack Russell Terriers are great little hunting dogs that will tackle anything from a fox to a mouse. They spend a large amount of time investigating their surroundings and when taken for a walk in the country will hunt for hours. They are extremely intelligent and as a result, beginning to make their presence felt in the obedience ring. Jack Russells make ideal house dogs, but are equally at home as outside dogs. The inquisitive nature of this breed necessitates having good fencing in order to contain them.